Street dance is usually performed to Hip Hop music and includes styles such as Breaking, Locking and Popping. More recently Commercial Dance (as seen on a lot of pop videos) has also become increasingly popular. Street Dance is a great style to learn because it can be performed anywhere, not just in a dance studio or on a stage. It is a great way to get into dance for beginners of any age. 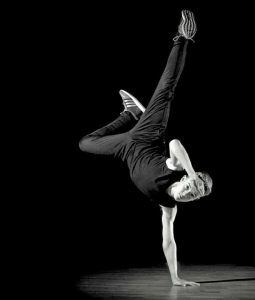 Street dance is constantly evolving as new moves and steps are introduced. We have structured Freestyle Dance lessons which touches on this style, but encourage pupils in Sutton Coldfield who really want to explore Hip Hop and Commercial Dance to take extra lessons in this style. The extra lessons are non-exam classes and instead work on different routines every few weeks. Pupils from Sutton Coldfield have used their Hip Hop and Commercial training to work in TV and film, including the lead-role in hit-movie Streetdance 3D, on the X-Factor performing live with Little Mix, My Camp Rock II (Disney Channel), The Next Step (CBBC) and Got to Dance (ITV). They have appeared in music videos for popstars including Numero UNO and Insenso. There is also the chance to create dance videos with Spotlight’s Hip Hop & Commercial teacher. Pupils have been asked to perform in professional Hip Hop shows including Pied Piper of Hamelin (Birmingham Hippodrome and UK tour). Spotlight and our pupils, including those from Sutton Coldfield have done incredibly well in Hip Hop sections at international competitions. At the 2015 Dance World Cup in Romania we won a silver medal for 17 Years & Under Hip Hop Groups and a silver medal for 13 & Under Duos & Trios. We repeated the same success at the 2016 Dance World Cup in Jersey again bringing home 2 silver medals from the biggest dance competition in the world.